Do you bet on horse racing? There’s a sizable portion of the equestrian market who don’t ever bet on horse racing, even if they do enjoy the sport itself. But you might be missing out on more than the excitement of shouting home your winning horse. You’re also missing the opportunity to contribute to an equine industry that has a tremendous impact on the health and well-being of all horses, from Shetlands to Shires. Horse racing benefits all breeds and disciplines of horses with funding for medical breakthroughs. Show horses enjoy advancements in sports medicine found through racing-funded studies. So let’s talk about the backbone of horse racing revenue: betting. The horse racing betting industry is worth billions in the economy, and it’s from wagering revenues that we see race purses, and it’s high race purses that can attract big financial backing for horsemen, resulting in better breeding, better training, and better horses. Going to the races and placing a bet is easily the most exciting way to bet on horses, but if you’re like me, you can get just as much excitement from watching racing at home. (Maybe more — if you’ve done the schlep between the paddock and the rail a few too many times, you know the true meaning of exhausted feet.) In this case you can use an online betting app or website like William Hill. Horse racing betting at William Hill is just one of the opportunities the site offers, but I think we all know it’s the most interesting! When I bet on horse racing I’m getting more than just excitement out of it — I’m getting the satisfaction of supporting horsemen who pour their lives into their horses’ wellbeing, and supporting the future veterinary advances which keep all our horses healthy and happy. If you’ve been with me online long enough, you know I’ve spent time in every aspect of the racing industry, from breeding to training centers to exercise riding and grooming horses at major racetracks. If you have questions about racing, or how things are done at the racetrack, please ask! I’m happy to answer them! You can also find a collection of writing I did at the racetrack over on Retired Racehorse Blog. 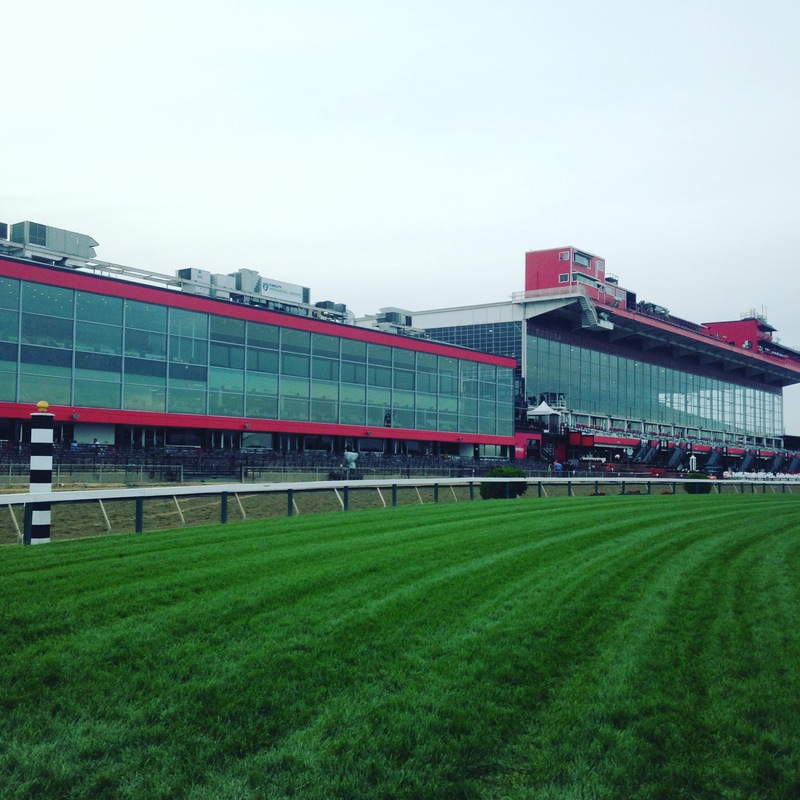 A few quick pics from the road, as we are in Baltimore for the Preakness Stakes! 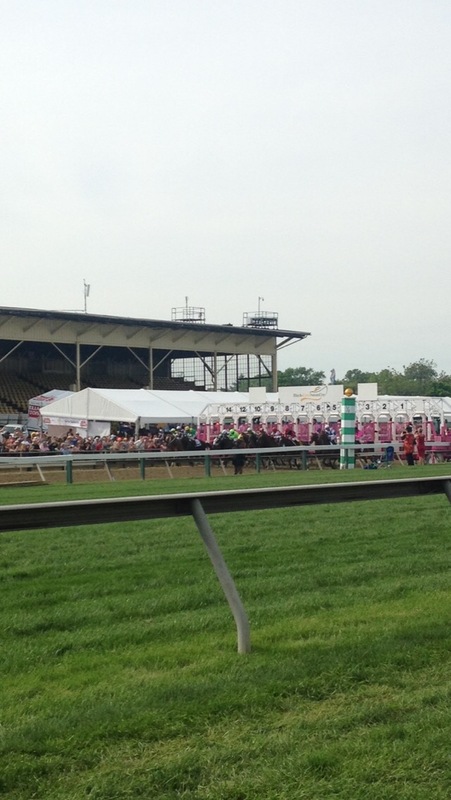 We had an amazing spot on the inside rail, thanks to a table in the Turfside Terrace. It made for intimate looks at the turf races. Black-eyed Susans – orange juice with vodka and Maker’s Mark? Something like that. These were served from a pre-made jug but they were still delicious so that says something about a successful recipe! 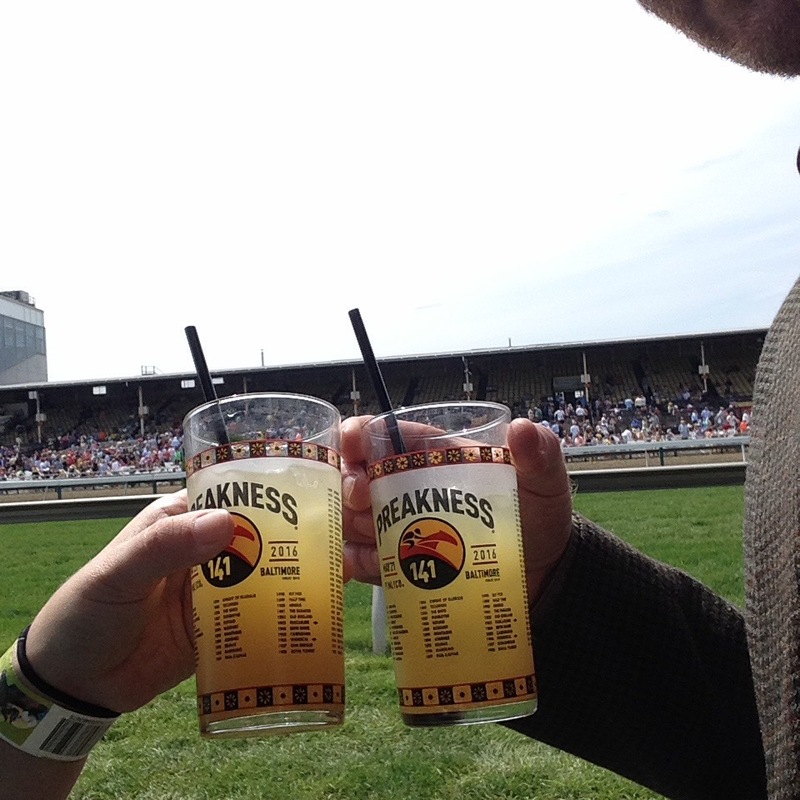 The awesome glasses were only $10 with the drink – that’s a very economical price for such an iconic souvenir. 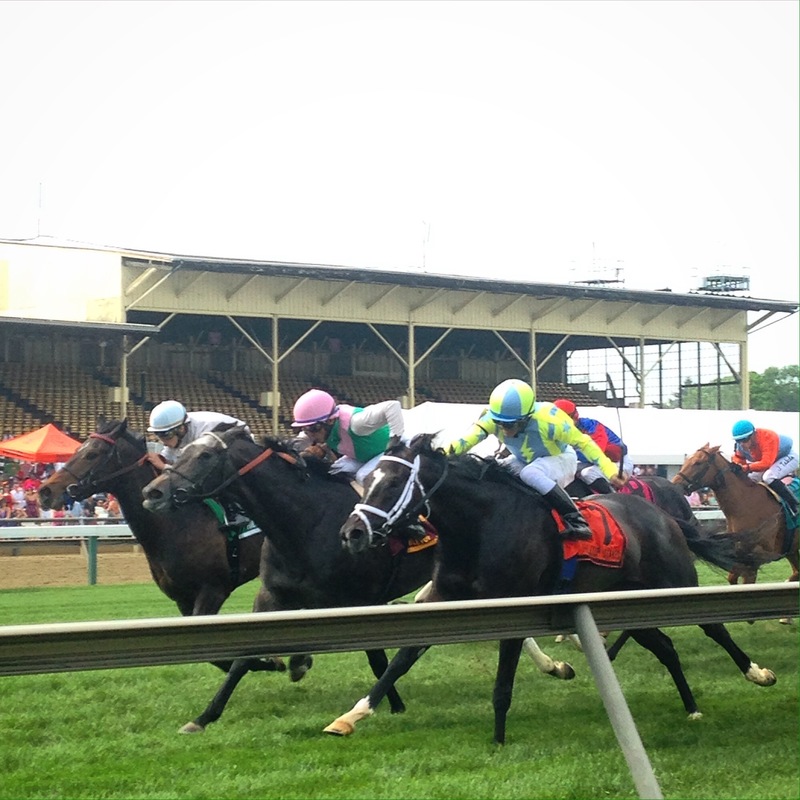 The start of the Black-Eyed Susan Stakes. Everything was pink. Even the starting gate. 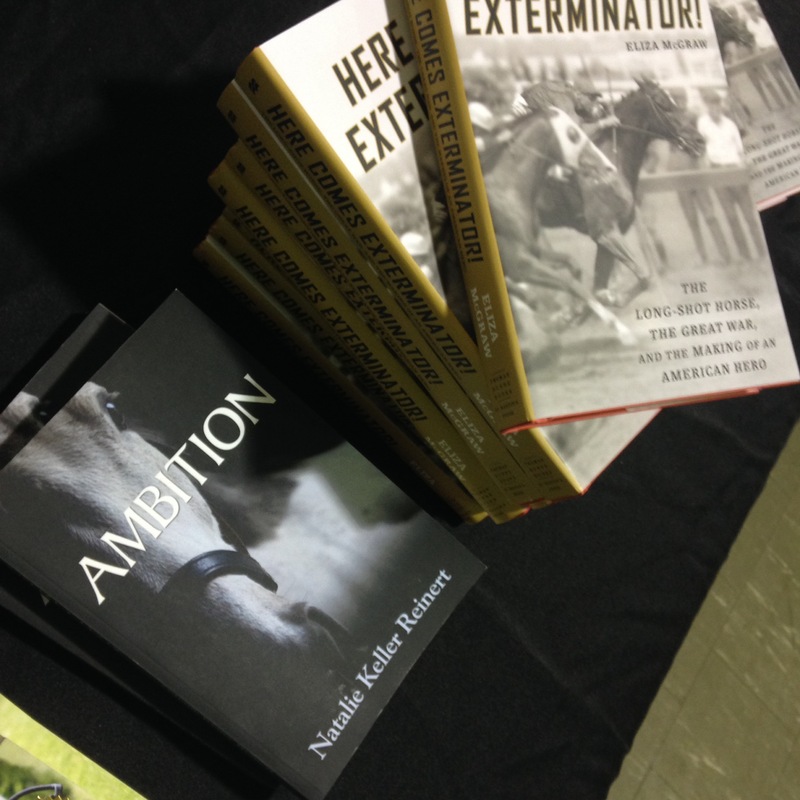 I brought along Ambition for the book signing event and sold out! Turning For Home was popular too. I was so lucky to be with Eliza McGraw, author of the new racing history Here Comes Exterminator! We had so much fun meeting fans and doing a little celebrity-spotting (trainers and jockeys edition). Crossing the course after the racing day ended. It was such a beautiful day of thoroughbreds and sport! Were we in Kentucky for 48 hours? We stayed three nights, so that isn’t quite right. But we only had two full days to take in the Bluegrass region — and believe me, it wasn’t enough. My novel Turning For Home was a finalist for the award, along with two other books about horse racing. This was basically an awesome excuse to finally visit Lexington! We had driven through once years before and stopped at Kentucky Horse Park, where I walked on the cross-country course and found Ralph Hill’s name on the huge chalkboard of competitors from the year before (I was his groom at the time), but that was it. Now we had a little time to explore. First: Keeneland Racecourse. Just driving to this racetrack was amazing, because outside its gates are the fabled white fences and cupolas of Calumet Farm. 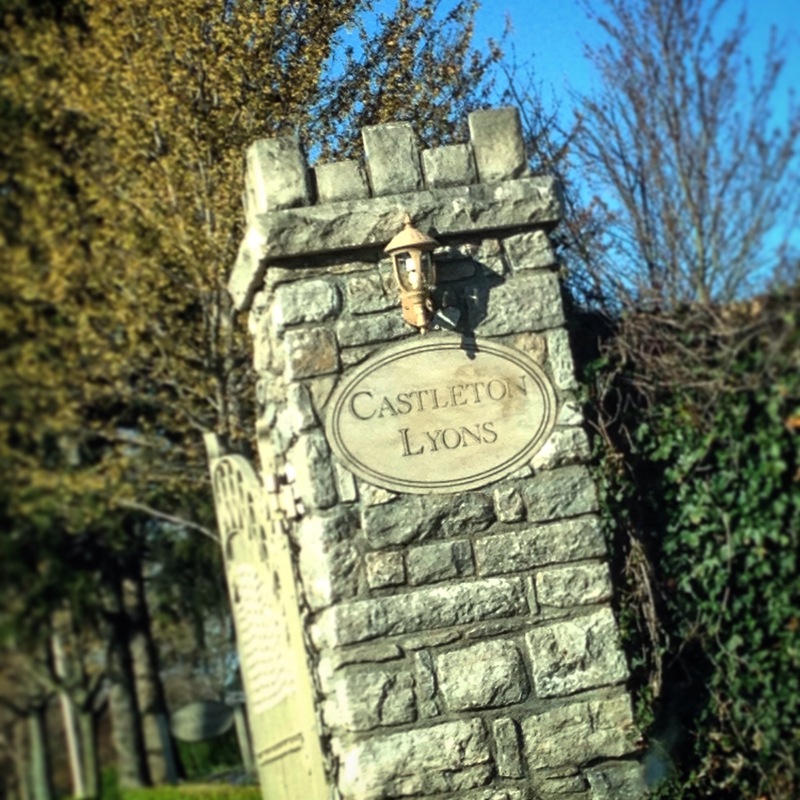 Drive through the grand old entrance and the grounds are exquisite, green rolling hills dotted with old trees. There’s even a library. A library. At a racetrack. I’m pretty sure that’s the definition of my heaven. After lunch we had time for another race before hustling to get ready for the award reception, which was held above the stallion barn at Castleton Lyons. At the award reception I was expected to stand in front of people and speak, something that my introverted little soul can’t quite cope with. Luckily I had two things: a little Jameson for courage, and whole lot of passion for my subject. Once I stood up and started talking about why I had written Turning For Home, everything was fine. I’m not sure what I said — something about retiring racehorses, something about how Thoroughbreds were the greatest athletes in the world, something about how much we love our horses, despite the way certain activists would like to portray Thoroughbred breeders and owners — but people applauded, which was nice. My face on the wall at the book award reception. The honors of the evening went to John Carter, author of Warriors on Horseback, a non-fiction book about jockeys. It’s impossible to feel any regret over not winning because John was Skyping in from England, and after he won, his wife brought his dachshund on-screen and waved its little paw at all of us in Kentucky. It was adorable. Totally worth letting John win this round! After the award was announced, there was some more “mingling,” which is when I stood very quietly by a table and tried not to look like I was going to have a panic attack. The second half of the reception was much better than the first, though, because now people knew who I was, and wanted to come up and chat with me about the book, encourage me to write more and try again for the big prize in another year, and talk about off-track Thoroughbreds, and their own retirement stories. It was really lovely to talk with some of the owners about how deeply they identified with my words. There are good horse-people in racing who are vilified with no warrant at all, simply because there are some bad people in the sport who don’t take care of their horses. It’s akin to painting every single show-jumper, or dressage trainer, or trail horse rider, with the same black brush because a former jumper or dressage horse or trail horse was found starving at an auction–and yet that doesn’t happen. That kind of pointless name-calling and groundless accusation is reserved for the horse racing business, and it’s ridiculous. 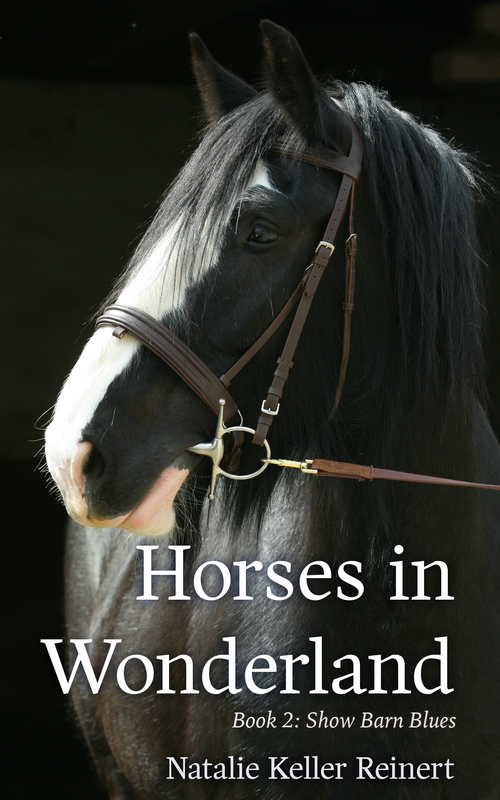 It’s not just ridiculous, it’s genuinely hurtful for people who love their horses. The Castleton Lyons stallion barn has an amazing entryway with memorabilia devoted to Gio Ponti and Justin Phillips. Gio Ponti’s Eclipse Awards – first ones I’ve seen in person! Absolutely lovely to see. I love the art and science of Thoroughbred breeding, possibly more than anything else in the world of horses. I’m hoping to visit Kentucky in the fall and make the rounds of stallion shows at the various farms — if I don’t make it back this year, I may have to do it in Ocala instead. The whole night wound up with a late dinner. If you can imagine a lot of racing journalists sitting around eating cheesecake and drinking wine while talking Derby prospects, that was pretty much the evening. For a girl who doesn’t go to parties because she might have to talk to someone, listening to the conversation was pretty great. That was the first half of our 48 hours in the Bluegrass. I’ll write up the second half later — it includes a visit to Three Chimneys, where I met Will Take Charge! Well, for the second year, I have a novel up for the Dr. Tony Ryan Book Award! I couldn’t be more proud of Turning For Home, the fourth novel in the Alex and Alexander series. Set in horse racing like the other novels in the series, Turning For Home deals more with retirement issues, including the dangers that rabid animal-rights activists can pose for horse owners, whether they’re guilty of horse abuse or not. The book features some racing, but it looks more at retraining an off-track Thoroughbred, and even features a Most Wanted Thoroughbred-style competition. Because of these themes, I wasn’t really sure how the award judges would view Turning For Home. Would it be too horse-show oriented for a racing panel? Would they see the animal-rights activists as a little too negative for a prize meant to celebrate horse racing? This year’s second novel, Turning for Home touches upon a currently red-hot topic: re-training ex-racehorses. Author Reinert was a semi-finalist in 2014 with Other People’s Horses. In Turning for Home a Thoroughbred once schooled by protagonist Alex is found starving, and though she is faultless, Alex becomes a target of animal rights activists. The story follows her leave of absence from racing to re-school the horse for a new career … and to fight for her own reputation. So, a semi-finalist once again — I couldn’t ask for more, really. I’m so excited at the way responsible racehorse retirement has become a front-and-central issue being addressed across the equestrian industry, from sport horse trainers to racehorse breeders, and everyone the horse will meet in between. When I started writing Retired Racehorse Blog more than six years ago, this big wave was a little ripple. Well, keep splashing, people! The rest of the semi-finalist list is really, really good this year, including a novel called If Wishes Were Horses, a book on jockey craft and a book on jockey heroes, and a documentary-style book collecting stories from racetracks across the country. This is a “I’m just happy to be nominated” moment, for sure. You can see the rest of the list here at Paulick Report. We made sure we were at the paddock just where she’d be walking and she did not disappoint. There was an ardent fan a few feet away from us who kept calling her “The Queen.” I read a line in a historical novel once, something like “the English love their queens.” You could say the same of us in horse racing: we love a good colt but man oh man do we love our fillies and mares. Shower before the walk home. I haven’t been paying much attention to the Triple Crown prep this year, with so much work on my plate, and I can’t even remember who won the Tampa Bay Derby — awful, I know! But I think a lot of us came away thinking more of the commanding style of Tepin winning the Hillsborough more than anything. When you see an Eclipse Award-winning mare come out and pound out a track record, it tends to put three-year-old colts in perspective. You’re still just little boys, my friends. But your time will come! That’s all for now. Have you read any of the other book award nominees? Which one’s your pick for the big win?